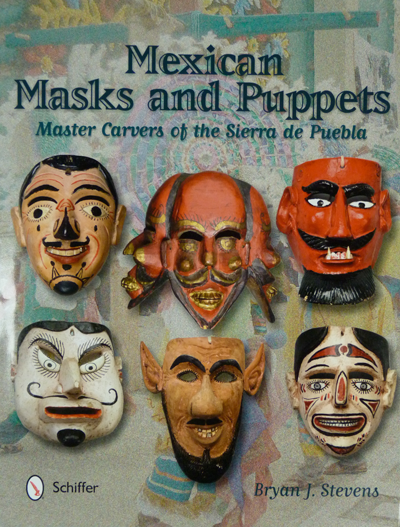 July 7, 2014 Welcome To Mexican Dance Masks, with introduction to the book—Mexican Masks and Puppets: Master Carvers of the Sierra de Puebla (Schiffer, 2012). Masks- Huehues by Benito Juárez Figueroa, earlier and later. July 14, 2014 More About Benito Juárez Figueroa, with portraits, his tools, and his masks—a black dog, a male Huehue, and a female Huehue. July 21, 2014 The Tejoneros Dance, with dance photos, telon (curtain) photo, pecking woodpecker, Huehues, the stuffed Tejón, the puppets behind the telon, and then undressed, a Huehue Viejo (by Roberto Villegas Santiago), and a mysterious bird mask. July 28, 2014 Muñecos (Puppets) in the Dance of the Huehues, with photos (from Olintla, Puebla) of telon panel scenes, performing puppets, a climbing woodpecker, a climbing Tejón, Vernon Kostohryz holding a giant Chénchere (woodpecker) carved by Roberto Villegas Santiago, comparison of large versus normal sized woodpecker, woodpecker details, beautiful Roberto Villegas Puppet set with box, and beautiful puppet set from Xonalpú, performing and then without costumes, the woodpecker from that same set, and a Guajillo (gourd that pops open with the pull of a string) from Zoatecpan, Puebla completes the post. August 11, 2014 Mexican Masks—An Important Book by Donald Cordry, with explanation of mixture of excellent and false, followed by parade of excellent masks to illustrate—favorite Michoacán Diablo, Placido Alamea Mayo Pascola mask, Guerrero Crow Diablo, and Manueles Hombre by Nalberto Abrahán that was converted to Diablo. August 18, 2014 Mexican Masks—An Important Book by Donald Cordry, Part 2, with complete listing of alleged decorative masks, and illustrated for comparison by good masks—Yellow Corcovi by Victoriano Salgado, Ancient Rastrero (Tlacololeros dance in Guerrero), Pastorela Diablo from Michoacán, Vieja La Roqueta, Male and female pair of Catrines with mechanical eyebrows from Tlaxcala, Moro Chino from Guerrero, small Moro from Collison collection (Penn State Library), Black and White Negrito by Filiberto Lopez Ortiz, Cuenebuela (hacienda owner), Tejorone with feather headdress from Mixtec Costa of Oaxaca, leather Tigre from Zitlala (Thurow collection), Parachico with headdress, Azteca mask with Indian, Yaqui Pascola mask with missing mirrors, Chapakoba (Collison), Grooved Jaguar (Thurow to Stevens), Diablo with snakes (Michoacán), Torito with headdress from Suchiapa, Chiapas, Carnaval Moro from Veracruz, Rainbow painted Macho Cabrillo, Skull Judío from SLP, Grooved Matachine from Zacatecas (Thurow to Stevens), Luzbel with tin headdress (Guanajuato), Hermitaño with braid (Michoacán), leather mask from Tecuanes dance in Guerrero, Tastoanes mask with two Virgins from Jalisco, wax King and Queen masks from Jardineros, Oaxaca, Red Cora Elephant, ancient worn Rastrero from Chuck Thurow collection, Teloloápan, Guerrero, Tigre from Suchiapa, Chiapas, with Tigre suit, Tigre mask from Chilapa, Guerrero, Female Huehue by Aurelio Vásquez, Moro with clacking jaw from Estado de México, and finally a trio of Archareos with headdresses. August 20, 2014 Additional Remarks by Charles Thurow Regarding the Decorative Masks Label, a guest editorial by my friend and fellow mask collector. No mask photos. August 25, 2014 Mexican Masks—An Important Book by Donald Cordry, Part 3, with some masks to illustrate from the Charles Thurow Collection (Chicago, Illinois), including a large Bearded mask with pink face, and with painted skull on the back, insect with human face on its back, yellow faced mask with pochote spines, mask with bat over human face, mask of caiman with human face on its back, oversized Tlacololero with split colors from Guerrero, Copper masks from Iguala, Guerrero, and a leather mask from Guerrero. Also there were masks from the Bryan J. Stevens collection, including a Diablo mask with curling nose from Tenampa, Veracruz, three eyed/two nosed fea from Oaxaca, three faced Santiaguero mask from San Antonio Rayón, Puebla, Tigre mask from Veracruz, and Eagle Knight from Veracruz. “El Chango,” a similar but smaller monkey mask that lacked vision slits. “El Viejo Major,” a human faced mask with vision slits. “El Chivo,” a small goat mask that also lacks vision slits. “La Calavara” has the face of a skull, and also lacks vision slits. I speculated that this group went from house to house, begging for food, on All Souls day, and that they had particular duties if there was a family mourning a recent death. September 8, 2014 La Danza de Matarachín is a dance found in the Totonac area of Veracruz during the first week or so in November. I showed masks of Pilatos, the leader of the dead forces in this dance. He can have either a smiling face (mask from Paso de Valencia, Veracruz), or an alarming frown (I neglected to show the mask carved in Rayon by Manuel Antonio Castañeda, see page 66 of my book. This was my oversight). I did show various Diablo masks that would have appeared in this dance, and two sets of masks that were worn by the Matarachín. September 15, 2014 A Moor Mask From Puebla, purchased recently on EBay, was the focus of this post. It was a child’s mask that closely resembled other masks in the Moya Rubio collection and in my own collection. September 22, 2014 Masks of Women From the State of Guerrero featured Malinche, plus the red mask attributed to an Amuzgo dance, Alma Potoicha, a Mulita female, Time, and La Roqueta. September 29, 2014 Diablo Masks from Guerrero, part 1, presented a Diablo from Tixtla like one in Cordry (page 103, Ruperto Abrahán), then one with red and black divided face from Elsa Rojo, then an EBay mask with curling tapered horns, a black enameled mask with such curling horns, another with silver fangs, silver horns, and a red star on the forehead, and a pink face with long slender horns that extend to the chin. October 6, 2014 Diablo Masks from Guerrero, part 2 switched to Diablos with upright or out curving horns, beginning with the great one from the Craft and Folk Museum in Los Angeles, then a squat black face with red horns, the sculptural black Diablo with black wooden horns and a hooked nose from Cavin Morris, a small black face with a red leather tongue and missing horns, and an all red Diablo with wide D shaped mouth, and short horns. October 13, 2014 Tigre (Jaguar) Masks From Guerrero began with a leather jaguar from the town of Zitlala, with a related video link. Three paper mache Tigre masks followed, and then several of wood, in the style of Chilapa, Guerrero. October 20, 2014 Tigre (Jaguar) Masks From Guerrero Part 2 began with a pair of Tigre masks from Olinola, then one from Tixtla Guerrero and a fourth from an unknown Guerrero town. October 27, 2014 Tigre Masks From the Tlapaneca of Guerrero began with an old and damaged Jaguar mask, followed by several wolves and two badgers or tejones and then two smaller masks. November 3, 2014 featured Tigre Masks From the Amuzgo Towns in Guerrero. There were two Tigres with mirror eyes, a related dog, and some smaller Tejones. This post includes a link to a wonderful dance video in which a dog and a woebegone old woman tempt the Tigre and are made to suffer. November 10, 2014 Masks by Magno León Part 1 features some terrific masks by a deceased master from the Sierra de Puebla, first a Lon Chaney type, then a very handsome couple, another well-carved man, and some smaller carvings- the hand of Christ and a small bust of a saint. November 17, 2014 Masks by Magno León Part 2 goes on to the Onion Lady and her husband, and a female mask from Helmut Hamm in Berlin. November 24, 2014 The Hormegas Dance begins with a Magno León mask of Satan pretending to be Pontius Pilate; he has goat’s ears that give away his true identity. An Hormega mask by Magno follows, and then a trio of masks from this dance by Polo González—the Ayudante, and two Hormega masks. At the end, for comparison, an Hormega mask by Benito Juárez is added. December 1, 2014 The Hormegas Masks of Benito Juárez Figueroa presents and compares five of these masks from the author’s collection, each a little different from the next. December 8, 2014 The Book Trip tells about a period of nearly two weeks when the author and his wife traveled in the Sierra de Puebla and handed out about 70 books to dancers, carvers, and their families who had assisted in the preparation of the book. There are photos of carvers and dancers, along with scenic views and even a constrictor snake that our car ran over on a dark road at night. There is also a Mickey Mouse mask that one carver made for his children to play with. December 15, 2014 La Danza de Lakapíjkuyu is danced during the Christmas season. The dancers represent the black birds that in legend shielded the Christ Child from the cold and wind; they wear black human faced masks. I show some Negrito masks by José González Galindo, Benito Juárez Figueroa, and Don Lillo. December 22, 2014 La Danza de Lakagolo includes a dancer wearing a large and dramatic mask of a bear. I show several bear masks, carved by José González Hernández, Leonardo Carcamo Palomino, and other carvers, along with some Viejo masks that are also used in the dance. December 29, 2014 The Santiagueros Dance features Santiago, the reincarnation of Saint James the apostle, riding on a white stallion. I show some of the wooden horses used by the Santiago character. One of the horses was collected with a Santiago mask and helmet. I also show some dance photos. January 5, 2015 The Santiagos Dance Part 2 presents more dance photos, plus an antique helmet, a belt of bells worn by the dancers, a dance wand, a chimal (ceremonial shield), and “sun shields” carried by one or another of the Santiaguero dancers. I also show some Santiaguero masks. January12, 2015 The Santiagos Dance Part 3 illustrates the masks of the Pilatos dancers and their leader, El Pilato or Pilato El Presidente. I begin with a scowling El Pilato mask by Manuel Antonio Castañeda, a mask so mean in expression that it must secretly represent Satan. Then I contrast this with a series of Pilato masks by the same carver, whose portrait also appears. January 19, 2015 The Santiagueros Dance: Masks by Narciso Iturbide Charo provides the opportunity for me to show some of my favorite masks, the oversized Santiagueros of Narciso, followed by a few others on a more normal scale. January 26, 2015 The Santiagueros Dance: Three Faced Masks by Narciso Iturbide Charo completes Narciso’s story. Starting from a dance photo c. 1980, I go on to show four of these three faced masks. In my opinion, these are the only authentic danced masks in all of Mexico that have more than one face, although many decorative masks with two or three faces have been produced. February 2, 2015 Dance Helmets Worn by Santiago in the Santiagueros Dance shows dance photos, carvings of Santiago wearing a helmet, and five danced helmets. February 9, 2015 The Tastoanes Dance tells about a dance drama in which Santiago, mounted on a live horse this time, is pitted against wild Indians, who kill him and dissect his body in act 1, before God restores him to health and he converts the Indians to Christianity in Act 2. I show three leather masks worn by the Indians, two from my collection and a third from a Collection in Berlin, Germany. February 16, 2015 Wooden Masks for the Tastoanes Dance features eight wooden masks from the Mexican states of Jalisco and Zacatecas. February 23, 2015 Semana Santa (Holy Week) in Michoacán begins a series about Holy week fiestas in various parts of Mexico. In Michoacán we find Fariseo or Judas masks as well as masks of Soldados (Roman soldiers). I include some interesting videos and related links. March 2, 2015 Semana Santa (Holy Week) in Other States of Mexico presented five Fariseo masks from Guanajuato, Jalisco, and Queretero. March 9, 2015 Semana Santa (Holy Week) in Other States of Mexico Part 2 included a Robeno (Roman) from Hidalgo, a Centurion from Chiapas, another from the State of Mexico, and a “Sinturion” from the same state. The post ends with a mask of Christ wearing a crown of thorns and three tin helmets that might have been worn by Roman soldiers, all also from the State of Mexico. March 16, 2015 Semana Santa (Holy Week) in the Mexican State of Guerrero -An Instance Of Judas Masks Being Marked By Coins (the 30 pieces of silver) presents five of these masks. March 23, 2015 Semana Santa (Holy Week) in the Mexican State of San Luis Potosí—Fariseo Masks of Devils and Related Characters, presents two Diablos, a dog demon, and an Obispo (a corrupt Abbott). March 30, 2015 Semana Santa (Holy Week) in the Mexican State of San Luis Potosí—Fariseo Masks of Skulls, presents four skull masks from that state. April 6, 2015 Semana Santa (Holy Week) in the Mexican State of San Luis Potosí—Fariseo Masks That Demonstrate Polarity, presented an evil king, a professor, a bloody and potentially violent figure, a smiling old man with a black face, another oversized black Viejo, an oversized Feo (ugly or misbehaving person), and an Oriental face with unflattering features (i.e. an outsider). April 20, 2015 Semana Santa (Holy Week) in the Mexican State of San Luis Potosí—Additional Fariseo Masks of Animals, such as an owl, an ape, perhaps another monkey, a comical dog, a more pensive dog, a rodent, and a frog. April 27, 2015 Some Additional San Luis Potosí Masks from John Levin, including a yellow diabla (female devil), a devil whose face is half black and half red, a green devil, a studio wrestler, and some professor Chango masks. May 4, 2015 Jaled Muyaes: Artist and Sculptor honors a famous Mexican collector and folk art dealer, and also acknowledges his wonderful wife’s contributions (Estela Ogazon). Late in life he withdrew from a plan to write the book of books about Mexican masks because he wanted to return to his roots as an artist and sculptor. I loved his work and managed to bring some of it back to Pennsylvania. May 11, 2015 An EBay™ Find presents a handsome Huehue or Tejonero mask from the Sierra de Puebla that was recently purchased on EBay by Helmut Hamm, a collector in Berlin, Germany. Helmut wondered whether one could identify the carver of this mask, based on its design details, which were striking and distinctive. By comparison with similar masks carved by Benito Juárez Figueroa, Benito’s father (José Juárez García), Benito’s grandfather (José Juárez), and Manuel Pérez, it proved possible to attribute the mask to the latter carver, Manuel Pérez. May 18, 2015 Another EBay™ Mask presents a mask of Santiago (Saint James the Apostle) from the Mexican state of Puebla, this handsome mask, which probably dates from the 1960s or 70s, was found on EBay. Although the actual carver’s name is undocumented, masks by this anonymous hand can be found in published books. May 25, 2015 Tin Tourist Masks From Taxco: Mexican Tinsmithing presents sixteen examples of these tin masks, along with a brief discussion of the techniques that have been developed by Mexican tinsmiths to produce such work. The names of these makers are unknown to the author. June 1, 2015 A Trip to the Mixtec Villages of Coastal Oaxaca For Carnaval introduced you to Puerto Escondido and the Hotel Santa Fe. It also revealed some 50-year-old masks that were carved by a deceased master, Filiberto López Ortiz, a deceased carver. These included a Tigre (jaguar) mask, incomplete masks of a Tigre and a Negrito, a remarkable mask of what must be an Ape, and a processional saint’s head and torso. I also included two old and danced Negrito masks and a Cuenebuela mask by this carver from my collection, for comparison. June 8, 2015 A Trip to the Mixtec Coast Part II focused on a visit to Ladislao López Ortiz, the brother of Filiberto. Ladislao is also a fine carver and this post included a number of his masks, along with one by Filiberto for comparison. June 15, 2015 More Mixtec Masks, this time from the collection of Randell Morris of Manhattan; he was curious about the identity of the masks’ carvers. The first, with a face that was half black and half white, was an excellent example of Ladislao’s work. I showed a similar mask by Filiberto for comparison. A second of Randell’s masks was also by Ladislao; it was magnificent! A third mask appeared to be the work of Filiberto’s apprentice, José “Che” Luna. A fourth that was quite different from the other three, with wonderfully dynamic carving, appeared to be the work of Filiberto López Ortiz. I included a similar mask from my collection. June 22, 2015 More Masks of Ladislao López Ortiz included two conventional Tigre (jaguar) masks, another that is unusual but beautiful and I ended with an un-danced mask of a skull. June 29, 2015 The Danza de los Parachicos and Their Masks introduced a number of Parachico masks and two Patron (dance leader) masks, some from my collection and others from the collection of Charles Thurow, from Chicago. July 6, 2015 Some Other Masks From Chiapas presents some very attractive masks of Tigre (jaguars), Toritos (bulls) and Monkeys. The dances that showcase these masks are interesting and playful, as one can see from the videos that are included. July 13, 2015 Monkey Masks From Guatemala opens a series of posts about the masks of Guatemala with seven varied masks with Monkey faces. July 27, 2015 The Patzcar Dance in Guatemala introduces many examples of masks of the Patron and his wife, the Patrona, plus just one very small mask of a Torito (bull). The post ends with an ambiguous mask- Patron or Gracejo? August 3, 2015 Gracejos and Mox Masks For The Patzcar Dance in Guatemala presents seven masks which may represent these dance characters. August 10, 2015 The Toritos Dance in Guatemala shows three highly attractive masks of bulls. August 17, 2015 Human Faced Masks From The Toritos and Conquest Dances in Guatemala begins with four masks of Alvarado, followed by many additional masks of Spanish soldiers or Vaqueros. August 24, 2015 Some Additional Masks For the Conquest Dance Of Guatemala includes five old and worn masks of Conquistadores and their Indian opponents. August 31, 2015 The Dance of the Moors and Christians in Guatemala includes masks of Moors plus one of Saint Christoher and one of a female character- Floripes. September7, 2015 Xacalcojes Masks Plus Some Others From Guatemala introduces Xacalcojes masks, which are quite interesting and primitive in appearance, and worn in remarkable but mysterious skits. I include a related mask from the Cerrrunes dance, another from the Baile Tunes or Tuncunes, and one that may have been worn by a Volador (flyer). This post ends with two interesting but mysterious masks from an as yet unidentified dance. September 14, 2015 Diablos in the Dances of Guatemala presents a varied assortment of devils. This ends the series on the subject of Guatemalan masks. September 21, 2015 Juanegro Masks From the Mexican States of Hidalgo and Veracruz introduced the most classic style. I showed two pairs of masks, plus a mask for the Viejo and a female mask that was worn by the courted girl, (although usually that character doesn’t wear a mask). September 28, 2015 Juanegro Masks From the Mexican States of Hidalgo and Veracruz Part II included three Juanegro pairs in the box style. October 5, 2015 Juanegro Masks From the Mexican States of Hidalgo and Veracruz Part III demonstrated the variation in Juanegro mask styles that one observes. I showed one pair and nine singletons, of which one was from the collection of John Levin. October 12, 2015 Juanegro Masks From the Mexican States of Hidalgo and Veracruz Part IV introduced masks from a variation of the Juanegro dance in which the suitors and their parents all wear masks. So I showed the two rivals and their respective parents. October 19, 2015 Masks With Realistic Features For the Xantolo Performance in the Huasteca showed mask like those for the Juanegro dance that included the masked parents, but these masks appear to be worn by Xantolos. October 26, 2015 Xipe Totec Style Masks For the Xantolo Performance in the Huasteca introduced the hypothesis that the most classic Xantolo masks are modeled on the legend of Xipe Totec, and that those masks represent human faces that are covered with the facial skin from sacrificial victims. I showed five examples. November 2, 2015 Xipe Totec Style Masks For the Xantolo Performance in the Huasteca Part II included four more masks in this style. November 9, 2015 Xipe Totec Style Masks For the Xantolo Performance in the Huasteca Part III included six more of those masks. November 16, 2015 Masks in Other Styles For the Xantolo Performance in the Huasteca showed more primitive styles (7 in all), including one that appeared to be dedicated to the Save The Children program. November 23, 2015 The Color of Death in Xantolo Performance shared my theory that some Xantolo masks are depicted with blue, green, or yellow skin in order to indicate that they represent the dead. I show seven masks. November 30, 2015 Red Xantolo Masks From the Huasteca reflects the observation that many Xantolo masks have red faces. There are ten of them in this post, and no two of them are the same. December 7, 2015 Some Additional Xantolos in Other Styles includes three with black faces, while others are silver, tan, or white, and one is unpainted but stained front and back due to use. December 14, 2015 Even More Human Faced Xantolo Masks in Other Styles is organized around six masks with primitive elegance. December 21, 2015 Animal Xantolo Masks From the Huasteca begins with a group of masks—a human face, a dog, a parrot, a rooster, and a hen that are clearly all by the same anonymous carver. December 28, 2015 Animal Xantolo Masks From the Huasteca II begins with two very attractive goats, followed by two interesting bulls with facial folds, and ends with a monkey mask. January 4, 2016 Animal Xantolo Masks From the Huasteca III include a pink dog, a black dog, two black pigs, and a pair of masks (a dog and a pig) where the main attraction is the polychrome paint. January 11. 2016 Masks from San Luis Potosí For the Xantolos Performance reveals three Xantolo masks from that state. January 18, 2016 Body Masks From the James and Jane Urmston Collection include a large Santiago horse, a smaller one, a Mermaid, and a Caiman, accompanied by some related masks such a Santiaguero. I included two masks from my collection that extend the picture- a Negrito and a Pescador (fisherman). January 25, 2016 Some Masked Dances in Xico, Veracruz, Featuring Masks From the Urmston Collection, prompted me to study and explore this mask tradition, now that borrowed masks were available to illustrate the story. These were nine red and white masks worn by Santiago and his supporters. February 1, 2016 The Moros y Cristianos Dance in Naolinco, Veracruz was enabled by a mask from the Urmston collection of a Caines dancer. Then I brought in two masks of Pilato, the leader of the Negritos or “dark forces,” and seven masks of the Negritos, all from the same town and dance to complete the picture. These included skulls, werewolves, pirates, rabid dogs, and vampires. I also found vivid videos that expanded one’s experience of the dance. February 8, 2016 Carnaval Moros or Enamorados in Veracruz includes four of these brightly painted masks from the Urmston Collection and five more that belong to the author. February 15, 2016 Catrin Masks From the Urmston Collection includes eight of these beautifully carved masks from the Mexican State of Tlaxcala. February 22, 2016 Some Urmston Collection Masks From Veracruz includes three Moors, Two birds, one Deer, two goats, a dog, and two Mojica masks, one painted blue. February 29, 2016 Urmston Carnival Bulls presents 10 Toritos plus one burro. Many of the Toritos illustrate the tendency to paint messages on the masks—names or memorial phrases. March 7, 2016 A Final Assortment of Masks From the Urmston Collection presents a final roundup of attractive and/or unusual masks from this private collection. March 14, 2016 Mojica Masks From Veracruz begins with a Mojica couple—Cortez and Malinche, followed by two more of these couples. The masks in one of these pairs are particularly elegant. March 21, 2016 Mojica Masks Part Two includes four Mojica masks and one of a male consort. March 28, 2016 Mojica Masks Part Three completes this series with three Mojica masks and one of a male consort. April 4, 2016 Carnival Bulls From Alta Lucero, Veracruz presents six bull masks and one of a ram, all from my collection. April 11, 2016 Azteca Masks From Veracruz presents five of these masks. April 18, 2016 Other Masks From Veracruz and Puebla With Prominent Noses reveals five masks with prominent or curling noses that turn out to be Santiagueros. April 25, 2016 An Additional Mask From the Huasteca Cultural Area presents a rare and unusual mask, accompanied by three dance wands, all decorated with cut paper. These objects appear to exemplify the concept of duality or dualism. May 2, 2016 A Few Additional Masks From the Santiagueros Dance in Veracruz presents some more long nosed masks, something like the Hormega masks found in the Sierra de Puebla, but from a different region. May 9, 2016 Diablo Masks From Veracruz demonstrates that some of these devil masks have horns while others do not. May 16, 2016 Masks From Huayacocotla Veracruz presents three dramatic and oversized masks by carver Modesto Sanchez, along with a fourth mask of more normal size. May 23, 2016 Additional Masks From Huayacocotla Veracruz that are not attributed to Modesto Sanchez; the carvers are unknown. There is an oversized yellow werewolf, a dramatic Vampire, and a whimsical trio—two Malinche masks with Cortez. May 30, 2016 Moro Style Masks From Veracruz, where “Moro” is a loose or generic term that tends to be applied to masks of Spaniards, who may or may not be soldiers, and from the Moros Y Cristianos or some other dance. This post includes five masks of Spaniards. June 6, 2016 Animals and Birds From Carpinteros begins with a riddle related to the last post, and then surveys these masks—three birds, a Rat, and a Green Tejón. June 13, 2016 More Animal Masks From Carpinteros includes a little fox, a savage dog, a friendly dog, a bull, and a deer, all in the style of Carpinteros and neighboring villages. June 20, 2016 A Few More Masks From the Huasteca includes a Peacock mask, an amusing or sinister yellow dog, a very large and impressive yellow pig, a monkey or clown, two probable Matachine masks, and an olive green mask of great age from either Carnival or Xantolos. June 27, 2016 Macho Cabrillo and Related Otomí Masks From Hidalgo presents four sinister looking Billy goats, a mask of the devil, and a colorful related mask which may be a modern version of a Macho Cabrillo? July 4, 2016 Yaqui (Yoeme) Pascola Masks introduces a new series of posts about masks and carvers from the Yaqui villages in Sonora, Mexico. In this post we see the work of Román Borbón. July 11, 2016 Alejandro Reyes Alegria, a Yoeme (Yaqui) Carver introduces a wonderful carver, long deceased, and who masks appear to relatively rare. In this post there is a Goat Pascola and teo human faced masks, all from the collection of the author. July 18, 2016 Alejandro Reyes Alegria, a Yoeme (Yaqui) Carver, Part 2 shows three more masks by this carver from the collection of David West—two terrific human faced Pascola masks plus a very rare example of a canine mask by Alejandro. August 15, 2016 Antonio Bacasewa Part 4—Monkey and Pig Faced Pascola Masks. August 22, 2016 Barney Burns and Mahna Drees Burns, Indian Traders, with some of their masks. August 29, 2016 Barney Burns and Mahna Drees Burns, Indian Traders, focusng on Pascola masks of Rodrigo Rodríguez Muñoz. September 5, 2016 Pascola Masks of Rodrigo Rodríguez Muñoz Part 2. July 17, 2017 La Pastorela II from Michoacán, Remarkable Devil Masks with 7 tiny devils across the forehead. July 24, 2017 Pastorela Diablos from La Cañada, Michoacán—Tanaquillo, Santo Tomas, and Ichan. July 31, 2017 Oversized Diablos from other areas of Michoacán, with relief carved snakes on their faces. August 7, 2017 Diablos From Michoacán Carved by Emiliano Fernández, with crossed green snakes over the face. August 14, 2017 A Very Large Diablo Next To Another That is Very Small, Plus Two Pig Diablos With Horns To Steal. August 21, 2017 Pastorela Diablos Found in Guanajuato, But the First is another Emiliano Fernández mask. August 28, 2017 Pastorela Diablos Found in Guanajuato II—Additional Very Large Pastorela Diablos From Guanajuato. September 4, 2017 Pastorela Masks From Lagos de Moreno, Jalisco. September 11, 2017 A Few More Pastorela Masks From Michoacán and Guanajuato—Hermitaños and Bato (the Foolish Shepherd). September 18, 2017 La Danza de los Viejos or Curpites in Nuevo San Juan Parangaricutiro, Michoacán. September 25, 2017 More Figures from the Curpites Dance in Nuevo San Juan Parangaricutiro, Michoacán—Tarepiti, Maringuilla, and Curpite Masks. October 2, 2017 Masks From the Danza de los Curpites Carved By Alejandro Sanchez Mercado Senior—Tarepiti, Maringuilla, and Curpite masks. October 9, 2017 Masks of Blackmen with Elaborate Headdresses. October 16. 2017 Three Bkackmen Masks from Sevina, plus Three Masks Converted to Blackmen by Black Paint. October 23/2017 La Danza de los Viejitos: Viejito and another mask by José María Ponce, Two worn old Viejitos, and a Nice One by Victoriano Salgado. October 30, 2017 Some More Viejitos: Three with Golden Hair and Beards, then A Maringuills Fea, and a sort of Rare Feo from Santa Fe de La Leguna, a Ch’chenchekicha. November 6, 2017 A Corcoví Mask by Victoriano Salgado and Three Tecolote (Owl) Masks, all from the Danza de los Viejitos in Michoacán. November 13, 2017 Feo Masks From Paso Ancho, Michoacán, From the Toritos Dance. November 20,2017 Three More Feo Masks From Paso Ancho, Michoacán With Snake Noses, From the Toritos Dance, Plus Viejo mask From That Dance. November 27, 2017 Three Perro (dog) masks Fron Cuanajo, Michoacán. December 4, 2017 La Danza de Torito in Silao, Guanajuato Area, Featuring Borrachas (Feas), and Video of Diabla. December 11, 2017 Los Tlacololeros of Guerrero, Masks of Tigres and Tlacololeros. Dec 18, 2017 Los Tlacololeros of Guerrero II, Taller Tlacolero Masks From Guerrero. Dec 25, 2017 Several Red Rastrero Masks and a Red Clown Mask From Tlacololeros Dance in Guerrero. January 1, 2018 Tlacololero Masks With Blowing Mouths. January 8, 2018 Tlacololero Masks With Beak Like Noses, and Related Styles. January 15, 2018 Two Tlacololero Masks With Other Unusual Noses. January 22, 2019 Mystery Mask With Slashed Face—Tlacololero, Pescador, or Moor?